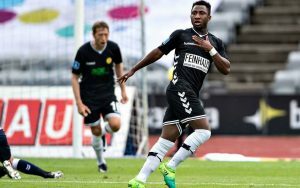 Ghanian player Joseph Mensah joined Danish Superliga club AC Horsens in 2014 from Liberty Professionals after a loan period at Slavia Prague. Mensah has taken well to football in Denmark and had two good seasons until he suffered a broken shin injury which kept him sidelined for almost 6 months in October 2016. Returning from injury in April he has dedicated the summer break to maximise his fitness and ensure he was match fit for the 2017 season. AC Horsens’ opening game took place this weekend against AGF Aarhus and Mensah was deservedly in the starting line up. AC Horsens went 1 – 0 up after 18 minutes and then the lead was doubled with an outstanding solo performance from Mensah. Leading up to the goal Mensah was skilful and controlled which was followed by a perfectly finished goal in the top left corner. The game finished 2 – 0 and Mensah’s goal one to be contended for the seasons best.